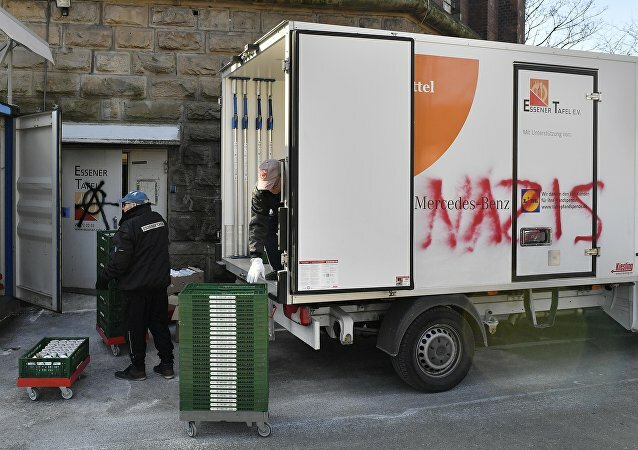 The charity branch in Essen has resumed giving out food cards to non-Germans after months of nation-wide uproar, accusations of xenophobia and vandals’ attacks. They followed its December’s decision to give food to the elderly and families rather than young single men from abroad. The German charity organization Tafel has given in to pressure following accusations of xenophobia and a graffiti attack, and will reverse the decision of its Essen branch to give food to the elderly and families rather than young single men and foreigners. With an influx of refugees stretching a local charity’s resources to their limits, a second outlet of the German food bank Tafel has stopped serving foreigners and young single men, prioritizing families, single parents with children and retirees.